Preheat the grill or barbecue. Sprinkle the steaks liberally on both sides with salt and pepper. Grill the steaks for 6-8 minutes per side to desired doneness, flipping once. Remove from the grill and let the steaks rest for 10 minutes before slicing thinly against the grain. Slice the rolls open. Then, layer 1/4 cup roasted red peppers on the bottom of each. 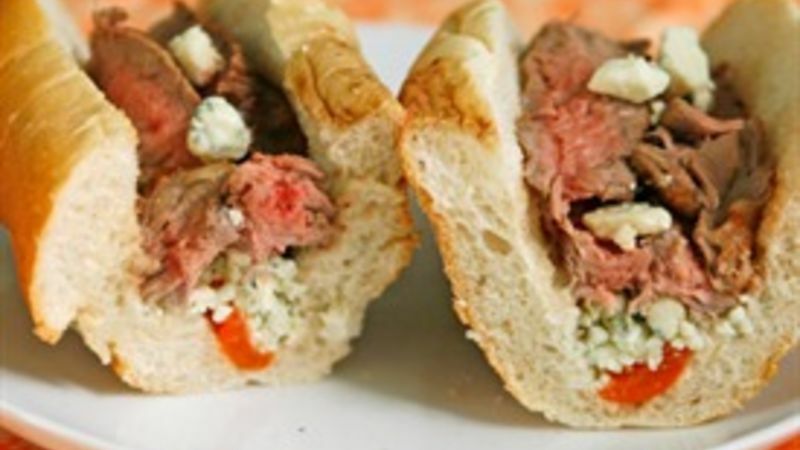 Top with 2 tablespoons gorgonzola cheese per roll. Divide the steak evenly among the rolls. Camping? You'll get hungry. Be prepared with simple grilled sandwiches that chase hunger to the hills. My family and I take an annual camping trip every year, and we love cooking outdoors. But we’ve quickly learned that food needs to be double duty, versatile and easy too. Months ago, we were talking about all sorts of camping-related recipes and articles to work on for Tablespoon. That’s when the idea of grilled sandwiches came to me. It’s something I have done before, but not to this scale or feasibility for camping. When I was thinking about how to make it happen, I quickly realized that the trick wasn’t just how to prepare the sandwiches on the grill, but also to ensure that the tools and prep methods were doable for someone who’s actually camping. So, there is emphasis on using few tools, and skipping ones that have limited use. As for ingredients? I kept them simple -- things that could be used in these sandwiches or others as well. So, as a quick recap, for these recipes you only need a few tools (cutting board, a good knife, a fork, spatula and tongs). You’ll also need a grate to cook on (either the one inside a grill or one fit onto an open fire. Once you have these basic things, you are ready to rock the grilled sandwiches.